The distribution problem for residues and non-residues has been intensively studied for 175 years using a rich variety of formulations and techniques. The work done in Chap. 7 gave a window through which we viewed one of these formulations and also saw a very important technique used to study it. Another problem that has been studied almost as long and just as intensely is concerned with the arithmetic structure of residues and non-residues. 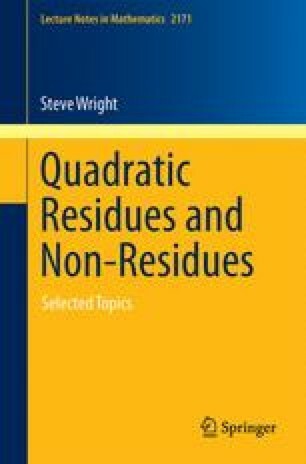 In this chapter, we will sample one aspect of that very important problem by studying when residues and non-residues form very long sequences in arithmetic progression. The first major advance in that problem came in 1939 when Harold Davenport proved the existence of residues and non-residues which form arbitrarily long sets of consecutive integers. As an introduction to the circle of ideas on which the work of this chapter is based, we briefly discuss Davenport’s results and the technique that he used to obtain them in Sect. 9.1. Davenport’s approach uses another application of the Dirichlet-Hilbert trick, which we used in the proofs of Theorems 4.12 and 5.13 presented in Chap. 5, together with an ingenious estimate of the absolute value of certain Legendre-symbol sums with polynomial values in their arguments. Davenport’s technique is quite flexible, and so we will adapt it in order to detect long sets of residues and non-residues in arithmetic progression. In Sect. 9.2, we will formulate our results precisely as a series of four problems which will eventually be solved in Sects. 9.4 and 9.10. This will require the estimation of the sums of values of Legendre symbols with polynomial arguments a la Davenport, which estimates we will derive in Sect. 9.3 by making use of a very important result of Andr Weil concerning the number of rational points on a nonsingular algebraic curve over ℤ∕p ℤ. In addition to these estimates, we will also need to calculate a term which will be shown to determine the asymptotic behavior of the number of sets of residues or non-residues which form long sequences of arithmetic progressions, and this calculation will be performed in Sects. 9.6–9.9. Here we will see how techniques from combinatorial number theory are applied to study residues and non-residues. In Sect. 9.11, an interesting class of examples will be presented, and we will use it to illustrate exactly how the results obtained in Sect. 9.10, together with some results of Sect. 9.11, combine to describe asymptotically how many sets there are of residues or non-residues which form long arithmetic progressions. Finally, the last section of this chapter discusses a result which, in certain interesting situations, calculates the asymptotic density of the set of primes which have residues and non-residues which form long sets of specified arithmetic progressions.